Just north of Timna continuing along the Israel trail you follow the Milhan ridge, a great area for hiking and photographs. We stayed overnight at the nearby campground, Be’er Milhan, a site that affords some protection from the wind (no toilets or running water). This photo was taken in the morning. Purple flowering bush is Spiny zilla (Zilla spinosa), a member of the brassicaceae family, you can eat the purple flowers which taste like cabbage. The technical details – the photo was taken with a Lumix point and shoot camera in March (ISO 80,4.1mm, F4 at 1/320 sec). Walking along Derekh Hevron towards the Old City you pass the Mount Zion Hotel on your right. Without a guide it is doubtful that you will notice the coat of arms sculpted in the stone of the building or recognize its significance. This is the emblem of the Order of St. John, a British charitable organization dating back to the time of the Crusades. They arrived in the Holy Land in 1882 and purchased land opposite Mount Zion overlooking the Hinnom valley with the aim of establishing an eye hospital. The hospital served Muslims, Jews, and Christians from all over the Middle East until WWI. During the war the Ottomans took over the building for use as an arms warehouse and parts of the hospital were destroyed by British shelling. An earthquake with epicenter near Jericho on July 11, 1927 damaged buildings in Jerusalem, including the hospital. British architect Clifford Holiday was in charge of the renovations of the hospital in the 1930s adding two new wings, the second on the other side of the road (today the Jerusalem House of Quality, a gallery and artists’ workshops, worth a visit). Holiday also built the nearby Scottish Church on Ketef Hinnom and the original Jerusalem City Hall. Without a guide it is doubtful that you would notice a box hanging on a cable from the corner of one of the buildings or understand its significance. During the Israel War of Independence the terrain and Jordanian sniper fire made it difficult to move men and supplies between the western part of the city and Mount Zion, both in Israeli hands. A tunnel was dug crossing the wadi but this only provided limited access. So in December 1948 Uriel Hefetz, an engineering corps commander at the Etzioni Brigade, conceived of the idea of stretching a 200-meter steel cable across the Hinnom Valley from a room in the hospital to the Israeli post at the Eretz Hatzvi school on Mount Zion. 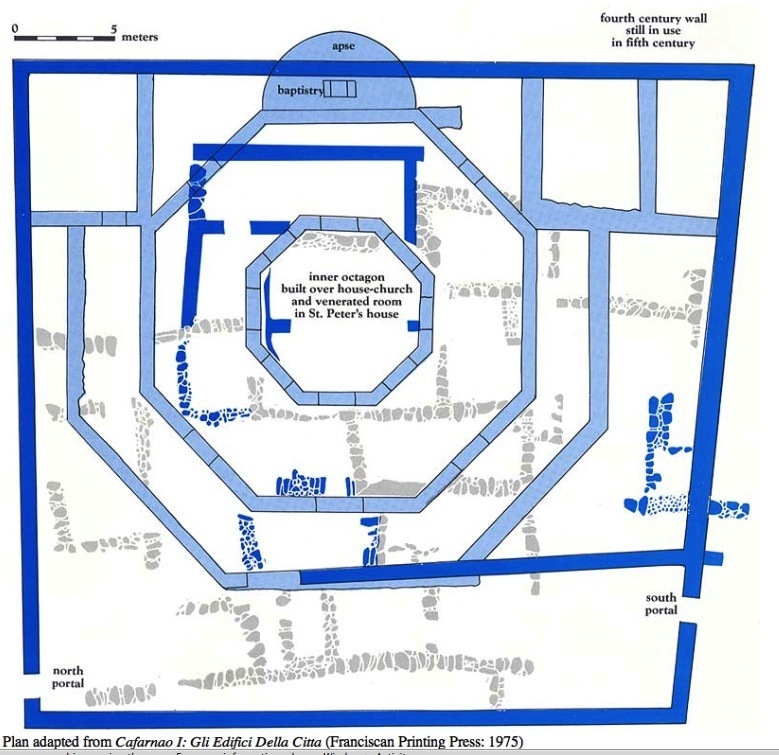 It was used during the night to transfer medicine and arms to Mount Zion and the wounded to the hospital. During the day the cable was lowered to the ground so it would not be discovered by the Jordanians. 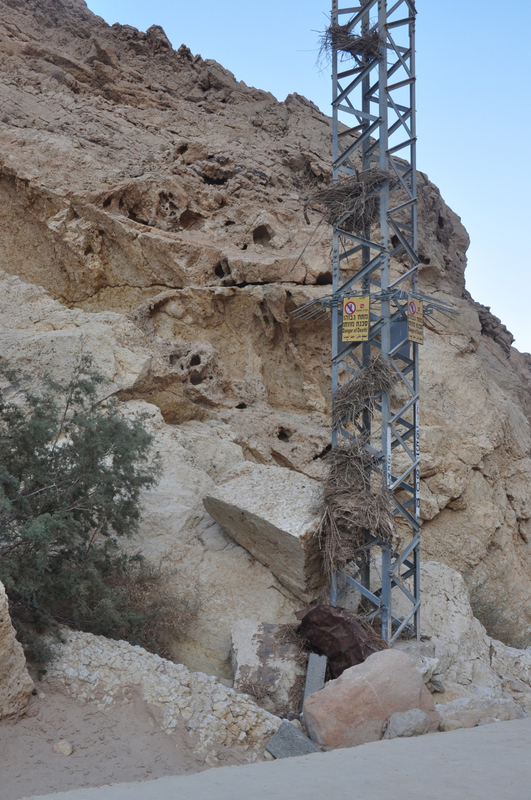 The cable was inclined with a maximum height of about 50 meters above the wadi. The cart that ran on the cable was just large enough for one person but could carry a weight of about 250 kilos. The original room has been made into a small museum housing the winch mechanism and other period artifacts. You won’t find this anecdote in any of the guide books, another advantage to hiring a guide. 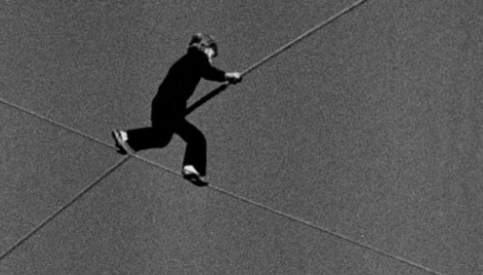 In 1987, Teddy Kollek, the mayor of Jerusalem invited the French high-wire performer, Philippe Petit (earlier, on August 7, 1974 Petit had walked between the Twin Towers of the World Trade Center in New York City), to walk the inclined cable across the Hinnom valley as part of that year’s Israel Festival. The performance, A Bridge for Peace, drew a crowd of 50,000 people from all parts of the city who stood in amazement. An Israeli, Uri Dromi wrote an Op-Ed piece in the December 16, 2009 edition of the New York Times where he reminisces about watching Petit. This was just few months before the first Intifada, but the excited crowd that gathered there on a sunny day had no clue of the lava ready to erupt below. Their eyes were glued onto the brave Frenchman and they held their breath for an agonizingly long time until he finally touched the safe ground on the other side. From the hotel you look across the Hinnom valley at Mount Zion, the Arab-Jewish neighborhood of Abu Tor and the Arab villages on the surrounding hills. This entry was posted in Architecture, Jerusalem and tagged british architect, guiding, history, israel war of independence, postaweek2011 on December 27, 2011 by Shmuel Browns. Approximately 50km from the development town of Dimona named after the Biblical city of the same name mentioned in Joshua 15:21-22 are two examples of makhteshim or erosion cirques, unique to the Negev and Sinai deserts. So far geologists have only identified 7 makhteshim, Makhtesh Ramon, Makhtesh HaGadol, Makhtesh HaKatan and two even smaller ones on Har Harif in the Negev; there are two in the Sinai. One of the special things about the Makhtesh HaKatan is that because of its small size you can view it in its entirety, a 5km by 7km oval shaped bowl with steep walls of resistant rock, in this case limestone and dolomite that covered a softer layer of chalk and Nubian sandstone that comes in colors of pink, purple, yellow and green. There are two access points into the makhtesh, Maale Hatzera on the northern wall is more gentle, an ancient camel pass and Maale Eli. 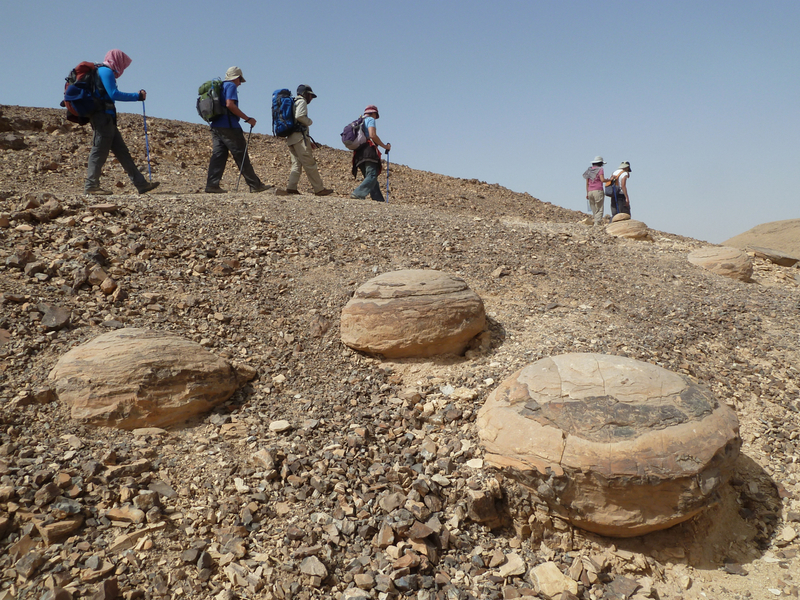 We started our hike from Maale Eli a route originally discovered by local Bedouin that traverses the steep limestone (from the Cenomanian epoch 100 million years ago) walls of the makhtesh connecting the floor of the makhtesh with Hatzera Ridge. I’ve heard various reasons for the name – Eli means upper from the same root as ascend; Eli means pestle to the bowl-shaped mortar of the makhtesh. In fact, it is named after Eli Ben Zvi, son of Rahel Yanait and Yitzhak Ben Zvi who was the second president of Israel. 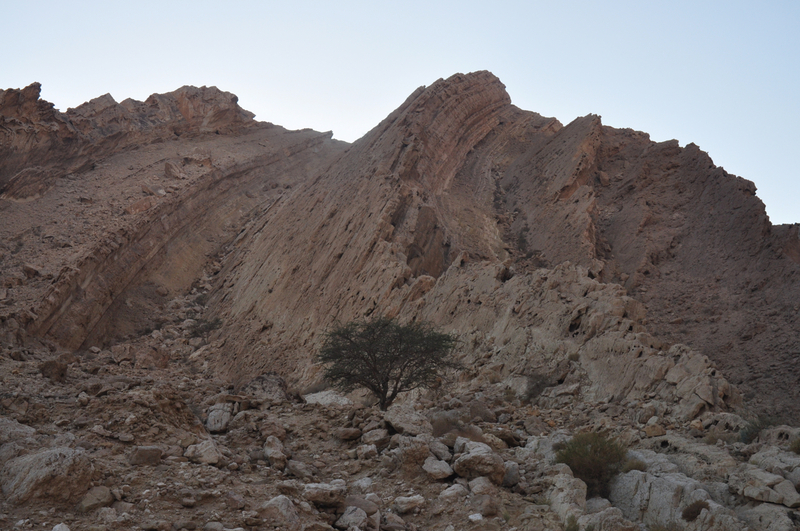 Eli was wounded during a training exercise with the Palmach in the makhtesh in the 1940s and this ascent was discovered in evacuating him to the nearest road joining Beersheva to Maale Aqrabim, the Scorpion Ascent built by the British. Like Masada the Makhtesh HaKatan became a symbol of knowing the desert and the land of Israel by a people who had come home after 2000 years of exile. We descended the steep walls of the makhtesh on a serpentine trail with the aid of rungs and railings, 400 meters to the floor of the makhtesh. From there we followed the red trail east (also marked as part of the Israel trail) passing hills and cliffs of colored sandstone to the mouth/exit of the makhtesh. The colors are produced by iron oxides, the sand from erosion of the Arabo-Nubian Massif carried all the way here by riverbeds. The hike is suitable for good hikers and should take about 4 hours. By the paved road that leads to the exit is an electricity tower and piled at various levels are branches that look like the nest of some large bird – they were deposited there in 1994 and 2004 when there were torrential rains and the water reached that high. For those looking for a long day hike you can follow the Israel trail starting at the Tamar fortress and descending into the makhtesh at Maale Hatzera. You walk south on the blue trail to the mouth of the makhtesh and when you get to the water pumping station you take the red trail west across the makhtesh climbing up at Maale Eli. Continuing another 10km to the Makhtesh HaGadol will take you past the spring of Ein Yorqeam, definitely worth a visit. The British figured that it would be worth drilling for oil in the makhtesh, erosion has already gotten rid of the hard rock and hundreds of meters of sand. They did not find any but for the same reason it is worth drilling for water. 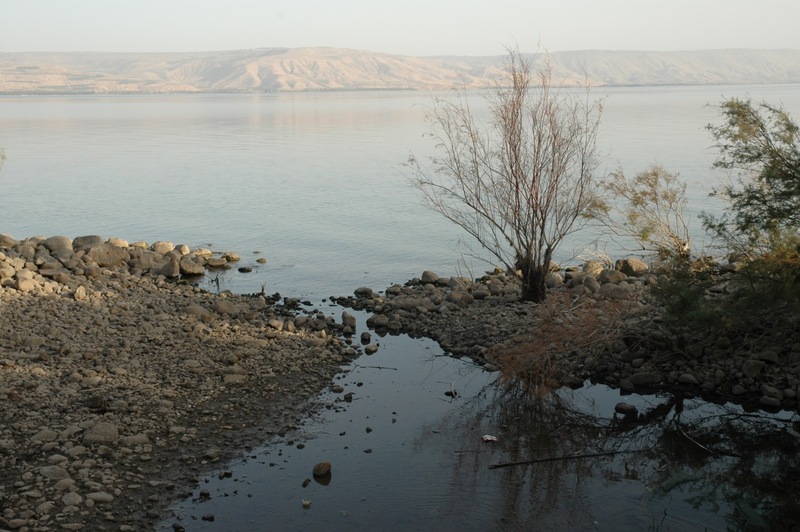 The sand in the makhtesh acts as a large aquifer though the water is quite salty. The water is piped to a reservoir on Mount Tzafit from where it is used by industries on the Rotem Plain. This entry was posted in Desert, Hiking, Nature, Photography, Water and tagged crater, desert hike, hike, Hiking, Israel Trail, makhtesh, postaweek2011 on December 20, 2011 by Shmuel Browns. Despite the many people traveling along the main road to Bethlehem (or Gilo or Gush Etzion) before the turnoff to Har Homa and Herodium few notice the ruins of a 5th century Byzantine church and monastery. Discovered by chance in 1992 when the road was paved and excavated briefly in 1999 by Rina Avner, the site is worth exploring but lies abandoned due to lack of money, time and initiative. Called the Kathisma church, after the word in Greek for seat (καθισμα), according to Christian tradition it is where Mary rested on the way to Bethlehem just before giving birth to Jesus. Most Byzantine churches are in the shape of a basilica, a rectangular plan with a central nave and two aisles, with a semicircular apse at the far end. Not exactly a church, the Kathisma is a martyrium, a special structure that functions as a church (or mosque) and marks the site of a holy event. Rather than a basilica, the church is octagonally shaped and built over a flat, protruding rock in the center. 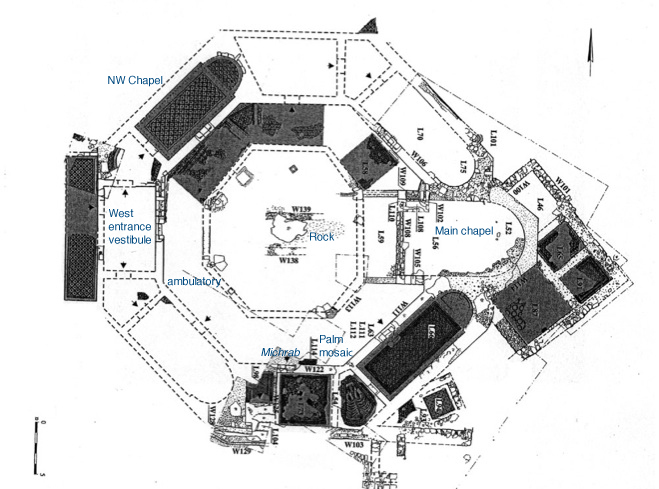 There are 3 concentric octagons, the innermost one around the rock, the second a walkway (ambulatoria) with one chapel and the outer one made up of 4 chapels and smaller rooms. The floors are covered in mosaics in geometric and floral designs in white, black, yellow, green and red stone tesserae. 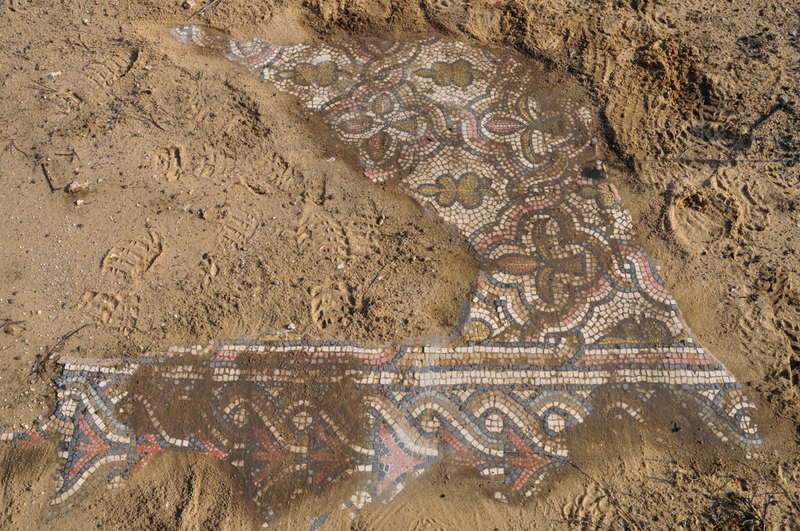 The mosaics have been mostly covered with felt mats and sand to protect them. 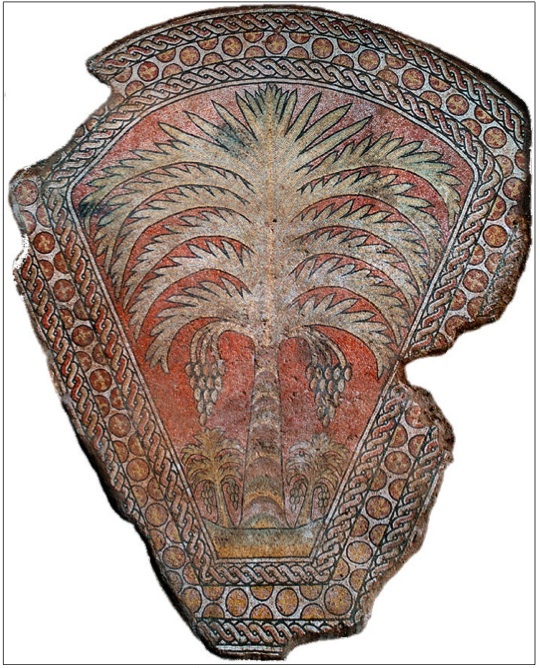 One of the finest mosaics is from the Arab period, an ornate mosaic of a date palm in the southeastern corner. According to the Koran, Mary sat and rested under a palm during the onset of her labor. There are ruins of another octagonally shaped church at Capernaum. 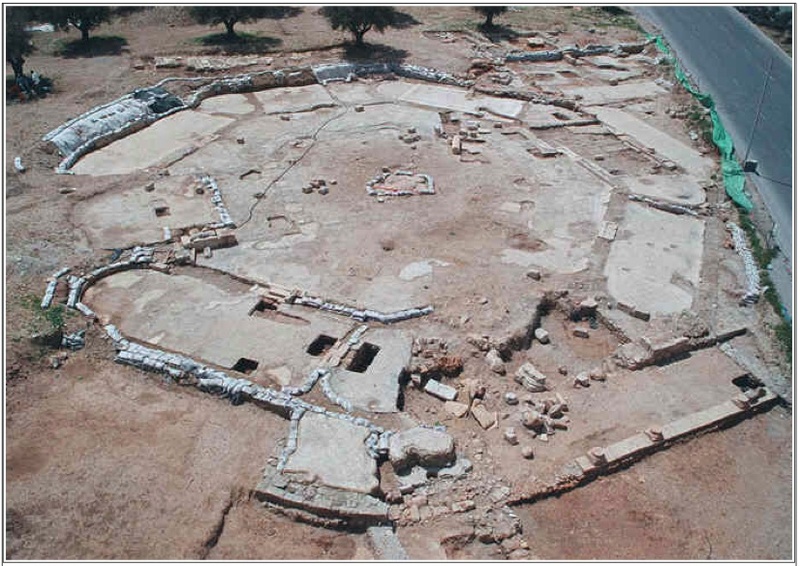 The remains of a 5thC church were uncovered that consist of a central octagon with eight pillars, an exterior octagon with thresholds still in situ, and a portico. Later an apse with a pool for baptism was constructed in the middle of the east wall. The central octagon was placed directly on top of the walls of Simon Peter’s house with the aim of preserving its exact location. The floor of the portico is a geometric patterned mosaic. In the area of the external octagon, the mosaics represented plants and animals in a style similar to that found in the Basilica of the Heptapegon at Tabgha. In the central octagon, the mosaic was composed of a strip of flowers, a field of fish with small flowers and a circle with a peacock in the center. 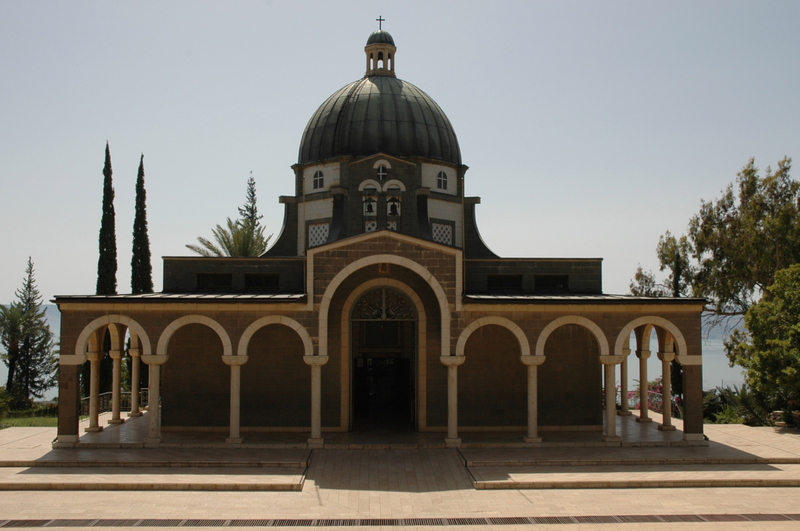 Another church that is octagon-shaped and crowned by a copper dome though enclosed in a rectangular envelope is the church on the Mount of Beatitudes. The church is from 1938 and was designed by the Italian architect Antonio Barluzzi in neo-Renaissance (Byzantine) style. 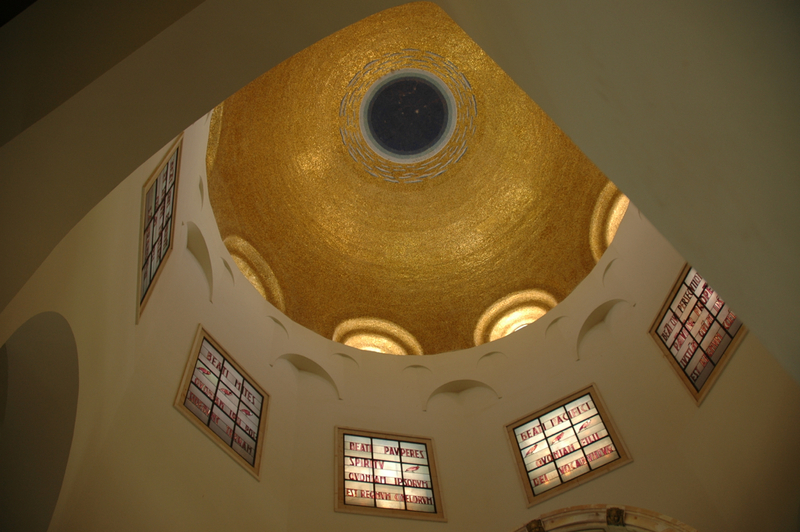 He chose the octagonal shape to match the eight beatitudes from the Sermon on the Mount (Matthew 5:1-5) and on the eight stained glass windows beneath the dome are verses from the Sermon. There are only a couple of other churches that have been built over a rock, the Basilica of the Agony and the Basilica of the Heptapegon but neither is an octagon. According to our understanding the Kathisma church was renovated in the 6thC and used as a mosque in the 8thC after which it was destroyed. A mihrab, or prayer niche facing Mecca was built into the southern wall of the outermost octagon. This means that the church was not destroyed during the Persian conquest and existed at the time of Abd el-Malik who commissioned the building of the Dome of the Rock, a martyrium in octagon shape over a rock – it may have been the inspiration for what has been called the earliest example of Islamic architecture. This entry was posted in Archaeology, Architecture, Jerusalem, Mosaics and tagged architecture, Byzantine church, martyrium, mosaic, octagon, postaweek2011 on December 15, 2011 by Shmuel Browns. Probably everyone who has been to Israel has tasted one of Israel’s most popular fast foods, falafel. It’s made out of mashed chickpeas with parsley, scallions, garlic, coriander and cumin. Formed into balls or croquettes it is fried until crunchy, stuffed in a pita with an Israeli salad of finely cut tomatoes and cucumbers and drizzled with tehina. There’s no point arguing about where to find the best falafel, everyone has their favorite. Since we live in Jerusalem, our family swears by the Levi brothers on the corner of Etz Hayyim and Tut street in Mahane Yehuda. There you can have falafel in a pita or rolled up in a lafa, a large, round flatbread. 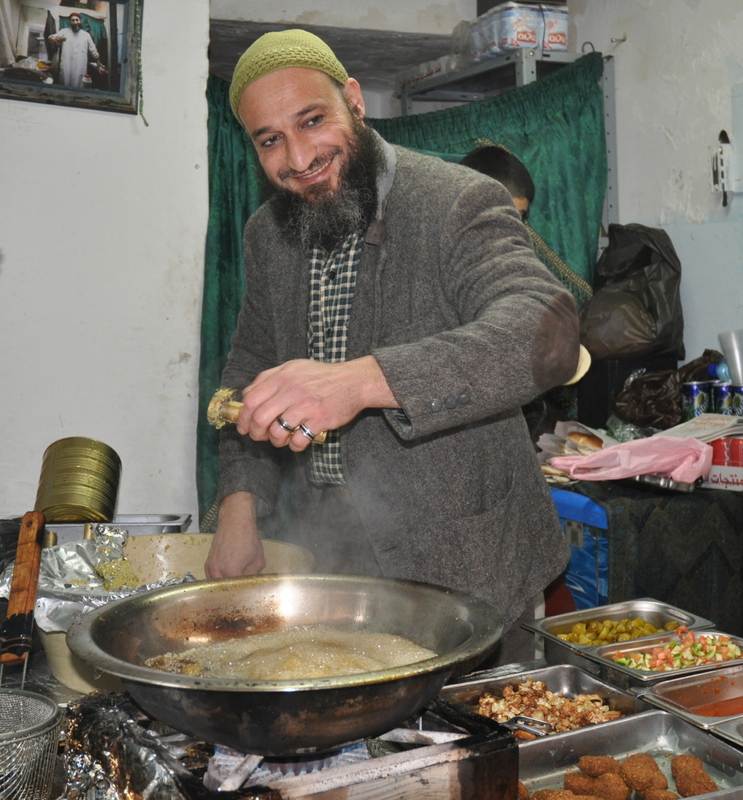 As a guide I spend quite a lot of time in the Old City and there are two fellows I’ve gotten to know who sell falafel on El Wad street that I like to support. Amin will give you a falafel ball to taste as you go by and gives a falafel snack to quite a few of the Arab children on their way home from school. You can’t beat his price, he sells a falafel in a pita with salad for 5NIS. A little farther along, on the opposite side of the street is a fellow selling falafel in pita from a cart; I don’t know if he’s deaf but he’s not able to speak – he’ll be happy to make you a sandwich. When you’re touring in the Galilee check out Falafel HaNasi in Afula. A friend shared this video that captures Golan in a virtuoso falafel in pita performance. If you have your favorite falafel stand, take a moment to tell us about it in a comment. This entry was posted in Food and tagged falafel, fast-food, fastfood, felafel, Israeli salad, lunch, postaweek2011 on December 12, 2011 by Shmuel Browns. Hiking throughout Israel is a national pastime – youth groups, the scouts, the army connect to the Biblical land with their feet. 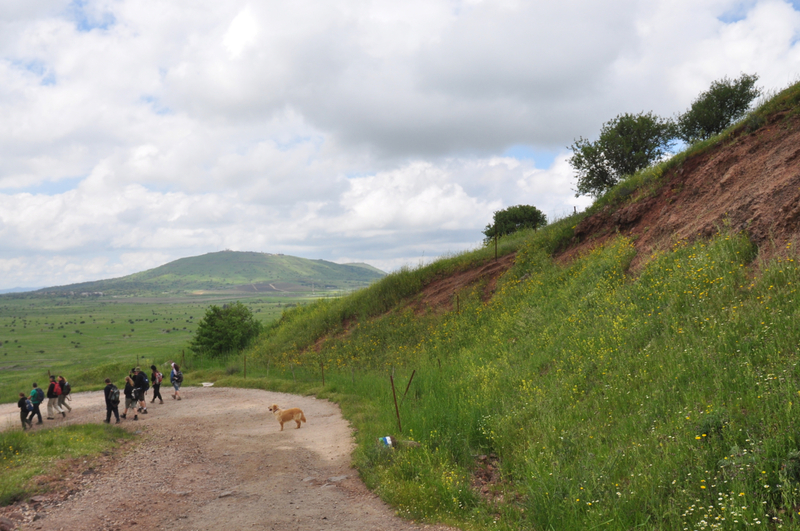 School classes have a tiyul shnati, an annual hike. Many young people who have just finished their army service reconnect with friends by hiking together on Shvil Yisrael, the Israel Trail, a 945 km trail that crisscrosses Israel, from Dan in the north to Eilat in the south. 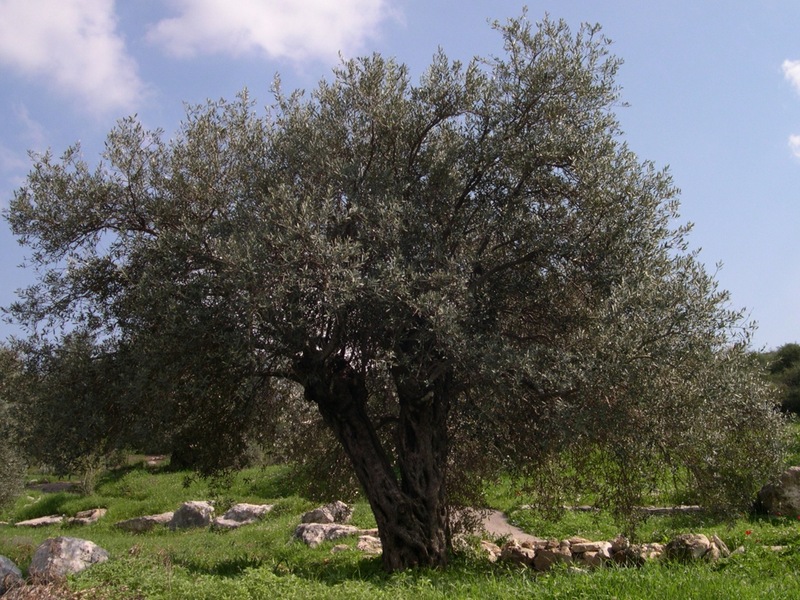 There is also a Golan trail, a Jerusalem trail, the Jesus/Gospel trail, a hike Sea to Sea from the Mediterranean to the Sea of Galilee. If you want to really experience and understand Israel you should take to the trails. Hiking takes you off the beaten track and besides the beauty of nature you will often come across archaeological ruins from thousands of years ago. If you don’t have a lot of experience hiking in Israel it’s recommended you hire a guide. Besides guiding you on the trail I can suggest what to bring, help with logistics, transportation and explain the nature and history and archaeology on the hike. 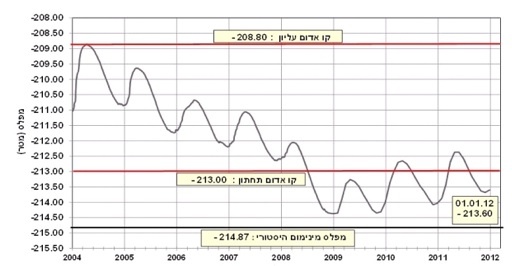 Israel is a small country which means you don’t have to travel far to start your hike. But although small in size there is incredible diversity so there are many different hiking experiences. Living in Jerusalem I know some hikes that are very close by, for example shvil hamayanot a trail that takes you to natural springs and pools that are particular to the hills of Jerusalem. 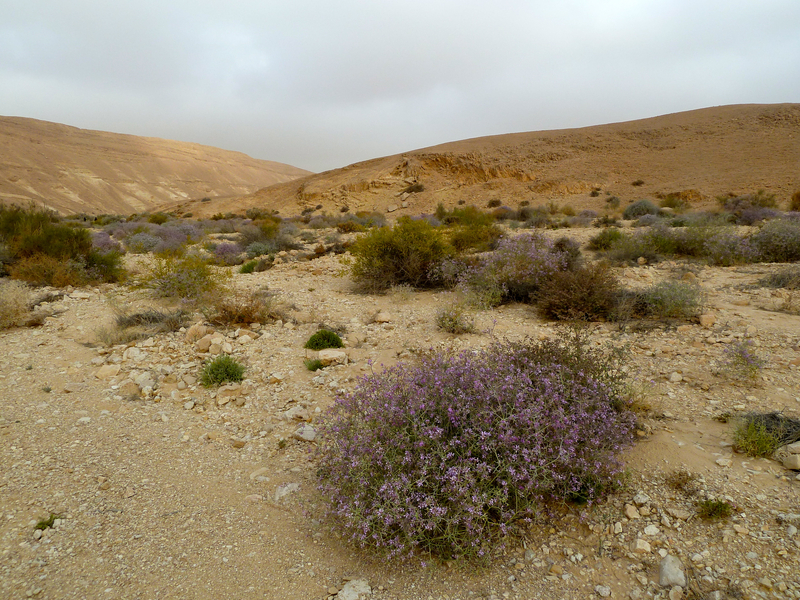 A hike in Nahal Katlav (a nahal or wadi is a dry stream or river bed) in December is an opportunity to see wildflowers like crocus blooming after the first winter rains. Jerusalem is a great base for day hikes because of its location in the hills and on the edge of the Judean desert and only a half hour drive to the northern edge of the Dead Sea. 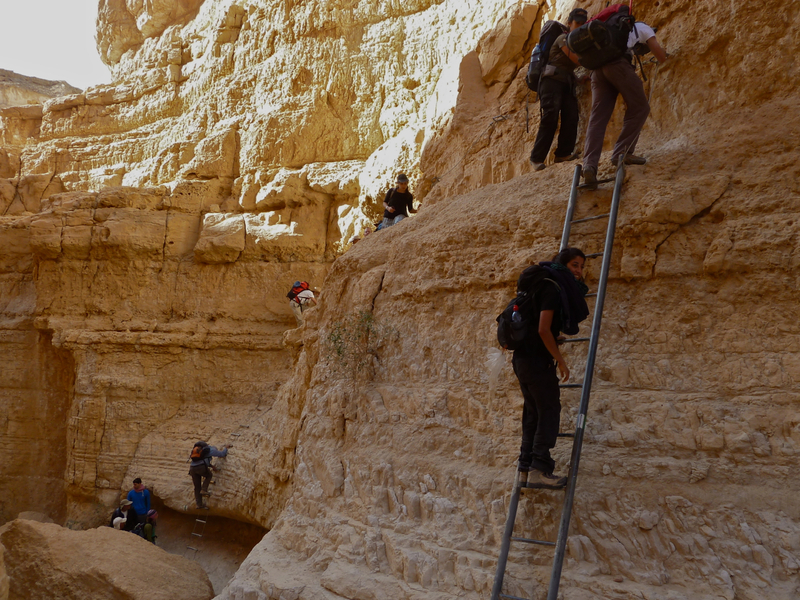 For starters I’d recommend hiking Nahal Og, desert landscape, narrow canyon, iron rung ladders – a really classic Israeli hike. Nearby is Wadi Qelt with a hike that takes you to a monastery hanging on the cliff. There are two wadis at the Ein Gedi reserve, Nahal David is the one most people hike and Nahal Arugot; you can choose trails, from 20 minute family hikes to challenging 4-6 hour hikes that will take you to pools and waterfalls in the middle of the desert. If you are planning to be farther south there is hiking at Mount Sodom, a salt mountain or try a night hike by the light of the full moon in Nahal Peratzim. 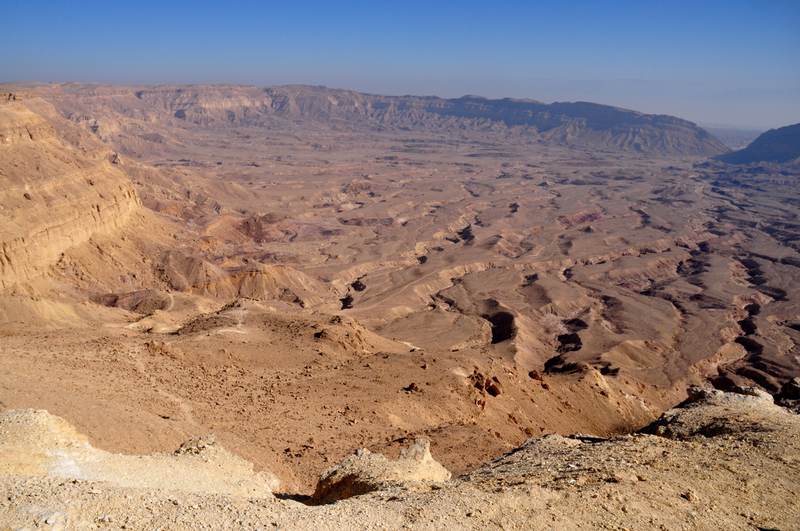 The Negev south of Beersheva is another desert with its canyons, mountains and springs to explore. 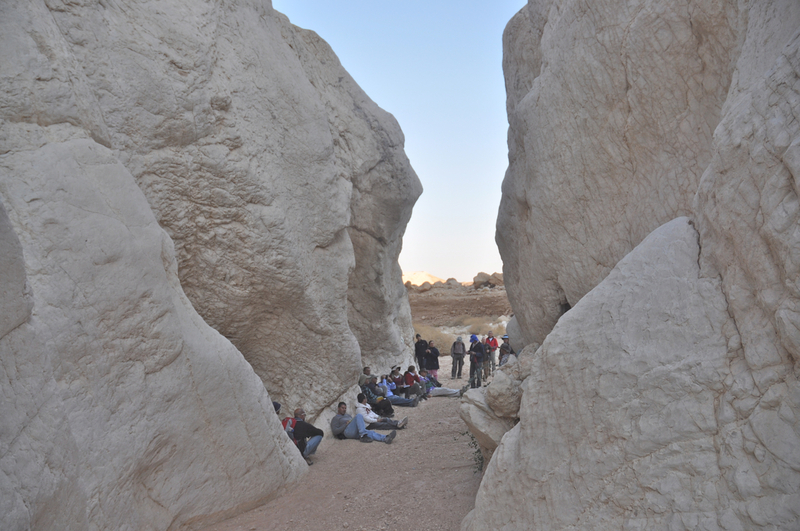 Unique to the Negev is a geological phenomenon called the makhtesh or erosion crater that should not be missed. Probably the most picturesque hike in Israel is a short hike that is appropriate for the whole family not far from Eilat called the Red Canyon where erosion has sculpted the red and orange sandstone cliffs. In the north of Israel there is a hike in the Mount Arbel reserve, where you descend the steep cliffs and then climb back up with great views of the Sea of Galilee and the Golan. Just a little farther north is the Nahal Yehudia reserve with a whole variety of hikes, Meshushim (hexagonal basalt) pool, Nahal Zavitan, Gamla. This entry was posted in Hiking, Jerusalem, Nature and tagged desert hike, family hike, Judean desert, nature hikes, postaweek2011, travel, Wildflowers on December 8, 2011 by Shmuel Browns.